"Medicine sometimes grants health, sometimes destroys it, showing which plants are helpful, which do harm." Dioscorides was born in the first century AD in Anazarba, a town in northern Cilicia (southeastern Asia Minor) and probably studied at nearby Tarsus, which was renown for the study of pharmacology. Describing himself as having lived a "soldier's life," he confesses to having traveled widely, including Greece, Crete, Egypt, and Petra. 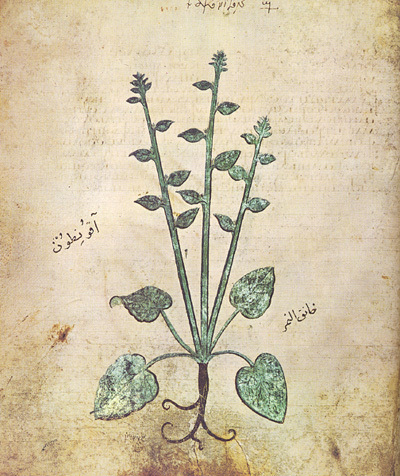 In about AD 65, after much direct observation of plants in their native habitats and careful practical experience on the medicinal uses of herbs, as well as those derived from animals and minerals, Dioscorides wrote De Materia Medica (as the original work in Greek is known in Latin) in five books "on the preparation, properties, and testing of drugs" (Preface, I), each chapter dealing with a single substance, its description, preparation, and therapeutic properties. In the Preface, Dioscorides indicates that, instead of presenting his materia medica ("the materials of medicine") in alphabetical order (which, he complains, "splits off genera and properties from what most resembles them"), "I shall endeavor to use a different arrangement and describe the classes according to the properties of the individual drugs." The scheme was to organize by category or class and then by the physiological effect of the drug on the body. This classification of drugs with similar pharmaceutical properties was too subtle to be readily comprehended, however, and was made even more obscure when, ironically, later copyists alphabetized the material, completely rearranging its original schema. De Materia Medica was the basis for pharmaceutical and herbal writing until the end of the sixteenth century, transmitted in large part by the increasingly voluminous commentaries of the Italian physician Pier Andrea Mattioli. The oldest and most famous copy of Dioscorides' De Materia Medica is an illuminated Byzantine manuscript produced about AD 512 for Anicia Juliana, the daughter of Flavius Anicius Olybrius, who was emperor of the western empire in AD 472. Presented in appreciation for her patronage in the construction of a district church in Constantinople, the parchment codex comprises 491 folios (or almost a thousand pages) and some four hundred color illustrations, each occupying a full page facing a description of the plant's pharmacological properties. A deluxe herbal, it may seem a surprising gift for an aristocratic matron but, given her responsibilities for a large household, presumably a practical one. In the Anicia codex, the chapter entries of De Materia Medica have been rearranged, the plants alphabetized and their descriptions augmented with observations from Galen and Crateuas, whose own herbal probably had been illustrated. Five supplemental texts also were appended, including paraphrases of the Theriaca and Alexipharmaca of Nicander and the Ornithiaca of Dionysius of Philadelphia (first century AD), which describes more than forty Mediterranean birds, including one sea bird shown with its wings both folded and open. "One treasure I left behind in Constantinople, a manuscript of Dioscorides, extremely ancient and written in majuscules, with drawings of the plants and containing also, if I am not mistaken, some fragments of Crateuas and a small treatise on birds. It belongs to a Jew, the son of Hamon, who, while he was still alive, was physician to Soleiman. I should like to have bought it, but the price frightened me; for a hundred ducats was named, a sum which would suit the Emperor's purse better than mine. I shall not cease to urge the Emperor to ransom so noble an author from such slavery. The manuscript, owing to its age, is in a bad state, being externally so worm-eaten that scarcely any one, if he saw if lying in the road, would bother to pick it up." In 1569 Emperor Maximilian II did acquire the Anicia codex for the imperial library in Vienna, now the Austrian National Library (Österreichische Nationalbibliothek), where it is designated Codex Vindobonensis Med. Gr. 1. (from Vindobona, the Latin name for Vienna) or, more simply, the Vienna Dioscorides..
A bibliographic note: Until recently, the only English translation of Dioscorides had been made in 1655, but it was not published until 1934, when Gunther edited the work. He admits that the plant names that head each chapter may not be justifiable and that "in many cases the plant described is apparently not the same as the plant figured." Indeed, Riddle reverses the names that are attached to IV.77 and IV.78, which he regards as Aconitum lycoctonum (wolfsbane) and Aconitum napellus (monkshood), respectively. Osbaldeston, on the other hand, identifies the Akoniton described in IV.77 as Aconitum napellus and the Akoniton eteron (the "other aconitum") in IV.78 as Aconitum lycoctonum. Identification is complicated further when one looks at the facsimile edition, where IV.77 (folio 67 verso) is identified as Akoniton napellus and IV.78 (f.68v) is labeled in Greek as Apokunon. Mazal identifies this flower as dogbane (Latin Apocynum), which belongs to the Asclopiadaceae or milkweed family. Beck identifies the plant in Chapter IV.77, which is said to grow in large quantities in Italy, as "Aconitum napellus L. (Another kind of leopard's bane) Wolfsbane," where "it is different from the one before it" (Leopard's bane, IV.76). The roots are used "for hunting wolves by placing them on raw meats: for they are deadly to the wolves that eat them." Coincidentally, the earliest reference to Dioscorides relates to aconitum, where it is cited by Erotian, a contemporary, in his discussion of synonyms for the drug in the "Glossary to Hippocrates." References: "The Vienna Dioskorides and Anicia Juliana" by Leslie Brubaker, in Byzantine Garden Culture (2002) edited by Antony Littlewood, Henry Maguire, and Joachim Wolschke-Bulmahn; Visualizing Medieval Medicine and Natural History, 1200-1550 (2006) edited by Jean A. Givens, Karen M. Reeds, Alain Touwaide; "The Herbal in Antiquity and Its Transmission to Later Ages" (1927) by Charles Singer, The Journal of Hellenic Studies, 47, 1-52; The Greek Herbal of Dioscorides (1655/1934) translated by John Goodyer and edited by Robert T. Gunther; Dioscorides on Pharmacy and Medicine (1985) by John M. Riddle; "The Preface of Dioscorides' Materia Medica: Introduction, Translation, and Commentary" (1982) by John Scarborough and Vivian Nutton, Transactions & Studies of the College of Physicians of Philadelphia, 4, 187-227; Ein Garten Eden (2001) by H. Walter Lack and translated by Martin Walters; Dioscorides Pedanius of Anazarbus: De Materia Medica (2005) translated by Lily Y. Beck; De Materia Medica: Being an Herbal with Many Other Medicinal Materials (2000) translated by Tess Anne Osbaldeston is a more accessible translation. The illustration is from Der Wiener Dioskurides: Codex medicus Graecus 1 der Österreichischen Nationalbibliothek (1998-1999) commentary by Otto Mazal (published in a reduced two-volume facsimile by Akademische Druck-und Verlagsanstalt).